Note the very distinctive white circular patch in front of the bright yellow eye, the flanks of this Goldeneye duck are not pure white indicating the start of eclipse plumage. 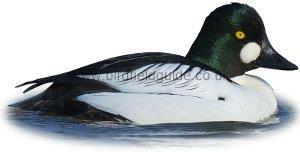 The Male Goldeneye in Winter has a greenish-purple head and neck, it's breast, underparts and flanks are white. It has white and black stripes along the side of it's dark back. It's head has a distinctive white patch in front of it's yellow eye. A very small number of birds breed in the highlands of Scotland but most breed in Northern Europe. Around 20,000 arrive in the UK from Europe to Winter. 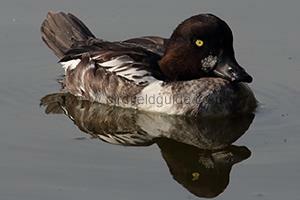 the Goldeneye is a diving duck and feeds on shellfish, insects, small fish and pond weed. It has an interesting courtship display which involves the Male throwing his heads back and displaying his white breast. The Goldeneye breeds close to lakes and rivers in forests where it nests in tree holes. During the Winter it can be found on almost any large areas of freshwater and occasionally on the sea and in estuaries. 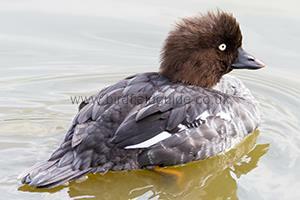 The female Goldeneye duck has a brown head and mottled grey body. It's crown is peaked and the tip of it's bill yellow. The juvenile bird is almost identical but lacks the peaked crown and yellow tipped bill. In Summer the Male Goldeneye has a generally browner body with the flanks, breast and head turning different shades of brown. The white patch in front of the eye is usually still there but much less pronounced, occasionally it looses it all together, but the 'messy' white and brown upper flanks help separate it from the Female. 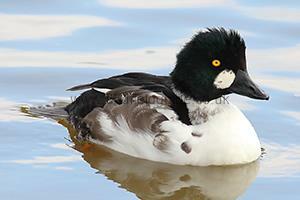 Note the grey body, brown head and white wing patch off this Female Goldeneye. The yellow tipped bill is just visible.